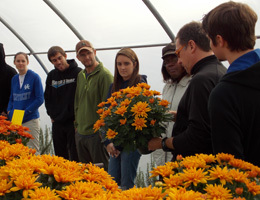 TCC horticulture students have been digging, planting and learning in the greenhouses on the Chesapeake Campus. And the end result includes a beautiful batch of pansies and mums for fall planting. The pansies are colorful and plentiful and include a new variety of Cool Waves. During the growing process, students encountered some problems. “We had some issues with aphids and low pH which resulted in a Fe deficiency, but we worked to diagnose the problem and ended up with some beautiful plants,” says Ken Spencer, Horticulture program head. The plants, on sale from the horticulture department, will grace tables and front porches over the Thanksgiving holiday. Editor’s note: Students have also been at work growing poinsettias for the winter holidays. Look for more information of these beauties soon.